Raw egg yolk is fine. Egg whites, not so much. Your cat's habit of pleading for every food she sees you eating can frustrate you as well as raise questions. After all, not all people foods are safe or appropriate for felines to consume. 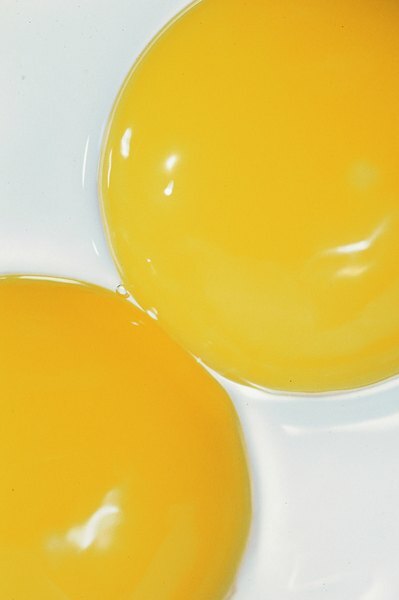 An occasional small treat of raw egg yolk may be OK. In small amounts, raw egg yolks are not problematic for cats, according to the Feline Nutrition Education Society. The nutrient-packed yolks are rich in proteins and amino acids that are integral for a well-rounded feline diet. They include lysine, tryptophan, phenylalinine, arginine, histidine, valine and leucine. Before introducing any new food item into your pet's diet, first consult your veterinarian. Raw egg whites are not suitable or safe for cats to eat due to their avidin component, the ASPCA warns. This protein is an antivitamin present in raw egg whites; it not only disrupts biotin absorption but also affects the chemical processes of energy, amino acids, glucose and fats. Because of this risk, it is important to abstain from feeding your cat raw egg whites, no matter how pitiful she may look as she gazes at you enviously. Raw egg whites can lead to a variety of different and very noticeable problems down the line, including issues with the fur and skin. When separating a raw egg, make sure no egg white remains with the yolk. A multitude of egg-separating methods exist. Throw away any remnants of egg whites, and allow your kitty only the yolk. If you notice absolutely any white matter, refrain from feeding your pet the yolk and try again. Your cutie is worth the extra effort. Another serious health benefit to occasionally feeding raw egg yolk to your cat is the fact that the stuff contains phosphorus, calcium, sulfur and protein -- all things that offer a lot of nutritional value to your little one. Although raw egg yolk does offer a lot in terms of nutritional bonuses, remember that it is entirely free of taurine, which all cats need in order to stay healthy and thrive. The bulk of your cat's food should be quality commercial food designed exclusively for cats, not raw egg yolk. Keep raw egg yolk as a "once-in-a-while" special snack, and keep raw egg whites out of your pet's life entirely. Feline Nutrition Education Society: Feed My Cat a Raw Egg Yolk? Essentials 4 All: Happy Cats! How Old Should a Kitten Be for a Leash? How Is a Goldfish Measured?